WHAT: Annual Faubourg St. John Neighborhood Association fund raiser with cuisine provided by local restaurants, open bar, live music. Tickets are for sale for $40 in advance or $50 at the door. Your ticket covers live musical entertainment, an open bar and fare from some of New Orleans most beloved restaurants. 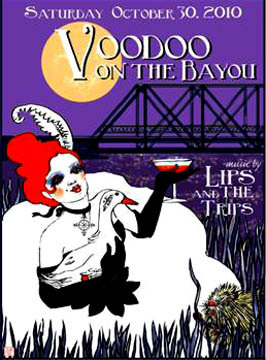 To join the Voodoo on the Bayou celebration, meet at the Pitot House at 1440 Moss Street on Bayou St. John on October 30, 2010. The party begins at 8:30 p.m. and goes until midnight. For more information, visit www.fsjna.org. or buy your tickets from any Faubourg St. John Neighborhood Association Board Member. A PARTY YOU CAN BRING A PARTY TO! Nope, and I don't care.